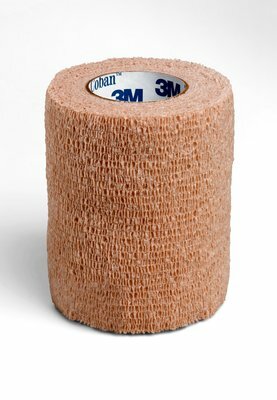 3M Coban Self-Adherent Elastic Wrap from IndeMedical.com functions like a tape, but sticks only to itself while providing controlled compression. Self-adhering, no adhesive or clips are necessary as the wrap stays in place with minimal slippage. Coban elastic wrap is comfortable and does not stick to skin, hair, clothing or surgical drapes. It is lightweight, breathable and moisture-resistant to maintain skin health. Elastic wrap's application and easy adjustment saves time. Suggested applications include light support, securing compression dressings, partial immobilization and even in the O.R for sterile isolation. Non-sterile. Fast and easy application, sticks to itself without need for adhesive, pins or clips.